Super sweet Doina from The Golden Diamonds blog, before Rick Owens, Paris, March 2012. I wish I could shoot in this type of light every day.....it was a fleeting 5 minute moment before the show when the sun peeped out from behind the clouds. Chinese model Tian Yi (Storm), after Valentino, Paris, March 2012. Australian model Montana Cox (IMG), after Cacharel, Paris, March 2012. Refinery 29's Associate Editor, the lovely Connie Wang, after Jason Wu, NYC, September 2012. 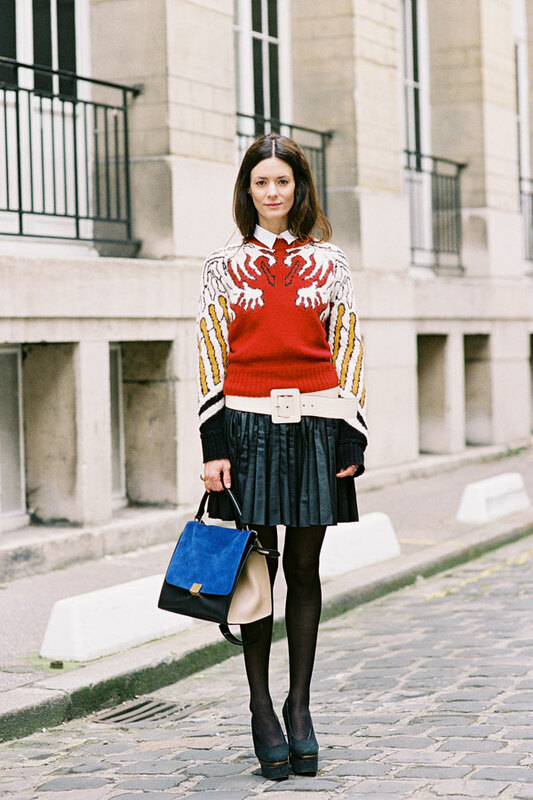 Like Elena's Kenzo sweater, each time I see a tiger/lion print intarsia jumper, I think to myself (not out loud thankfully - no one wants a crazy person around during the fashion weeks ;) Dorothy's line from The Wizard of Oz "Lions, and tigers, and bears! Oh, my!" Czech model Bara Holotova (Ford), after Yigal Azrouel, NYC, September 2012. There were cowboy/girl hats on the catwalk at Acne in London last week, and for AW12 Isabel Marant embraced a Western theme. How do you wear it in "real life" without looking to theme-y or like you just left a rodeo? Team a Western-inspired top with a leather mini, bare legs (for now) and a pair of studded ankle boots (Chloe if you have the budget ;) like Bara has. 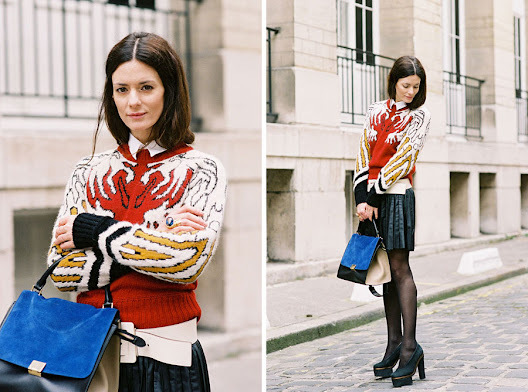 Elisa Nalin, after Chalayan, Paris, March 2012. Indian model Lakshmi Menon (Women), after Alexis Mabille Couture, Paris, July 2012. With the change of seasons upon us (and oodles of rain in the UK), it is the time of year when the mind turns to contemplating a holiday in the sun someplace warm over the Christmas/New Year period (Mexico, Cuba, Australia, Phuket, Argentina anyone?). I love the crisp, clear weather that heralds the change of summer into Autumn (the rain, not so much!) but after a few months of heavy grey skies, a holiday where coats, gloves and beanies are not required holds much allure. Lakshmi's lovely, fresh white on white ensemble (broken up with blue sunglasses and a colourful necklace) is the perfect outfit for sightseeing, shopping and lunching someplace warm. 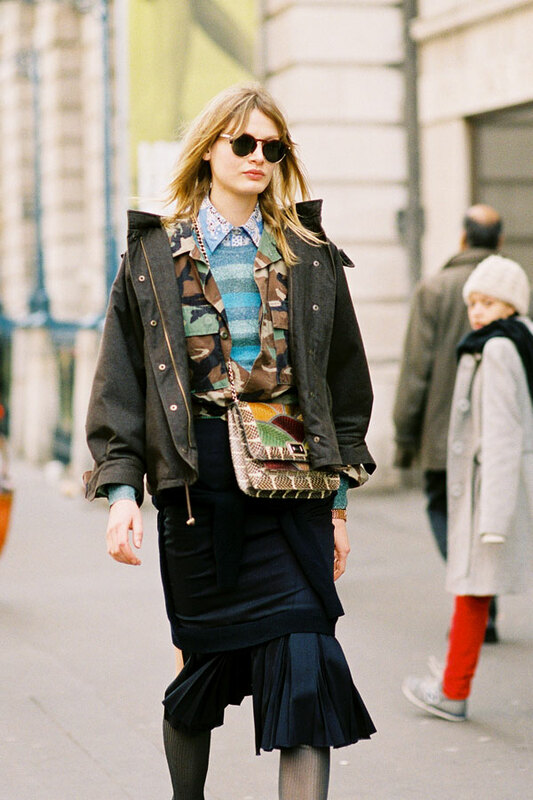 Before Stella McCartney, Paris, March 2012. It is lovely seeing all of the hair and make-up on the models after the shows but it is also nice to see how the looks translate to real life. Yesterday I posted photos of some of the models after the Rochas show with deep mulberry lips.....I found this photograph today and it reminded me of the berry/wine lip colour from the show. Note that she has kept all of her other make-up super bare (maybe a hint of mascara and neutral eyeshadow). 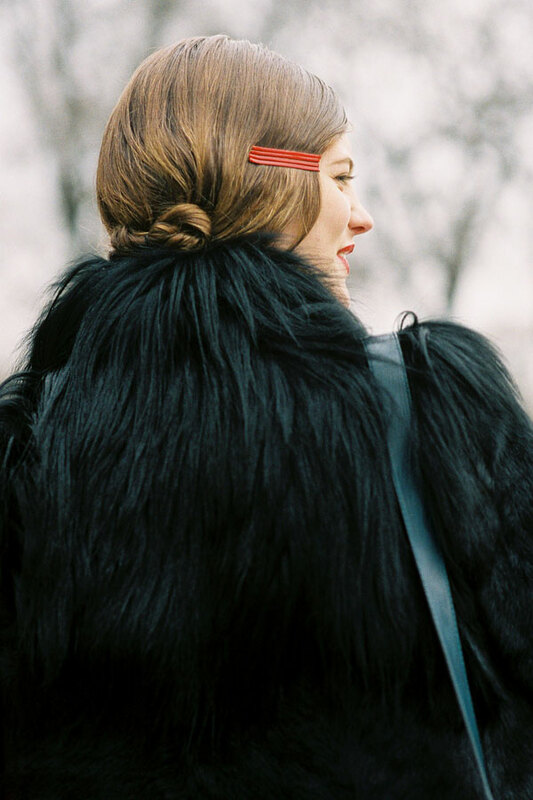 Autumn hair and make-up inspiration after Rochas, Paris, March 2012. It has been raining all day in London and feeling decidedly chilly, so I thought I would post some rich (almost goth inspired?) make-up and hair looks (via Josefien Rodermans, Mackenzie Drazan and Alana Zimmer) from the Rochas show in March. Embrace your inner dark side by smooshing on some rich mulberry, wine, black-red lipstick while keeping everything else clean and bare. American model Kel Markey (Supreme), after Yigal Azrouël, NYC, September 2012. 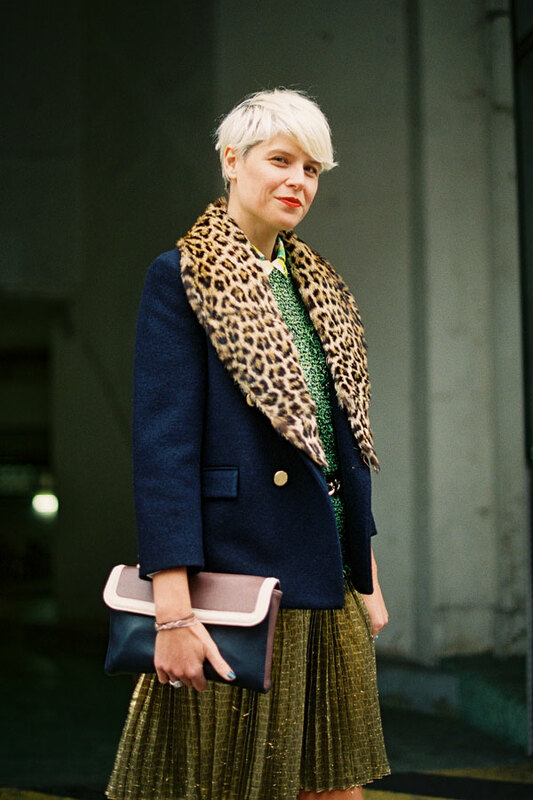 Hedvig, before Carven, Paris, March 2012. Lovely Hedvig wearing a slightly different version of the Carven sweater that Anne-Catherine wore (in my post from last week). It is always fun to see the different ways that people style similar (or the same) items to fit their own personal aesthetic. Tatiana, after Chanel Haute Couture, Paris, July 2012. The ever-fabulous Anna Dello Russo, after Paco Rabanne, Paris, March 2012. Vika Gazinskaya (in a dress from her own collection) before Jean Paul Gaultier Couture, Paris, July 2012. 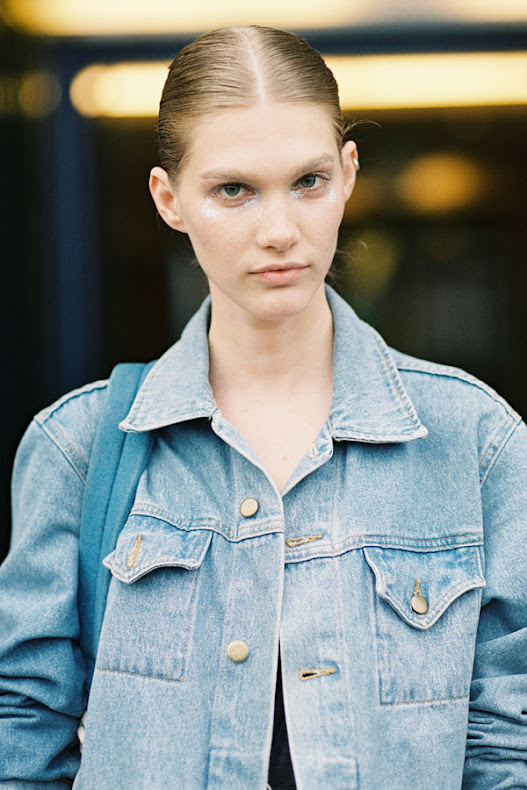 Norwegian model Erjona Ala (Ford), after Yigal Azrouel, NYC, September 2012. Serbian model Georgina Stojilkovic (Supreme), after Jean Paul Gaultier, Paris, July 2012. It is now jumper/sweater weather in London but for those who live in warmer climates, a crisp white t-shirt, a pair of printed pants, slicked back hair + light-weight jacket = easy transeasonal weekend wear. 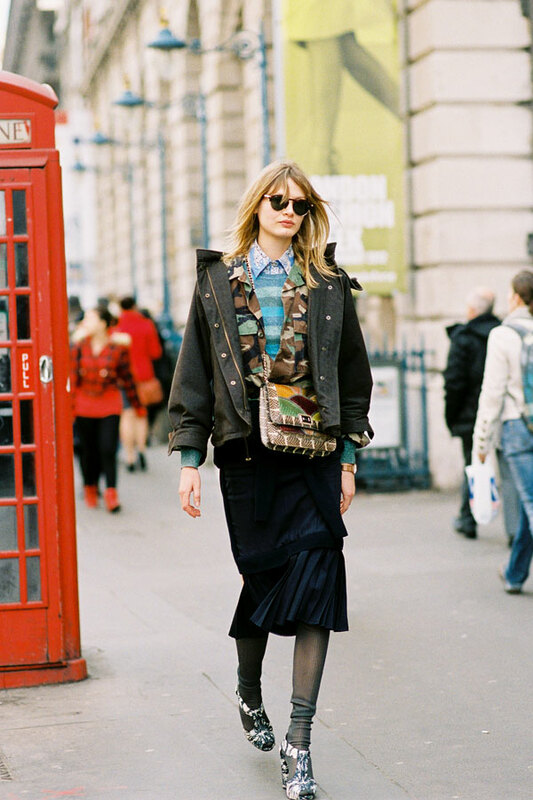 The amazing stylist and model Victoria Sekrier, Somerset House, London, February 2012. Tank magazine's Caroline Issa, Pairs, March 2012. No matter how exhausted or stressed (or how high her shoes! ), Caroline always manages to look so wonderfully serene, poised and elegant. The gorgeous Kate Foley, Buyer for Opening Ceremony, before Alexander Wang, NYC, February 2012. American model Maria Bradley (DNA), after Yigal Azrouël, NYC, September 2012. Russian model Irina Nikolaeva (Ford), after Giambattista Valli couture, Paris, July 2012. Throw on an oversized bleached denim jacket for the cooler Autumn days and nights ahead. Danish models Caroline Brasch Nielsen (Marilyn) and Josephine Skriver (Marilyn), after Elie Saab couture, Paris, July 2012. 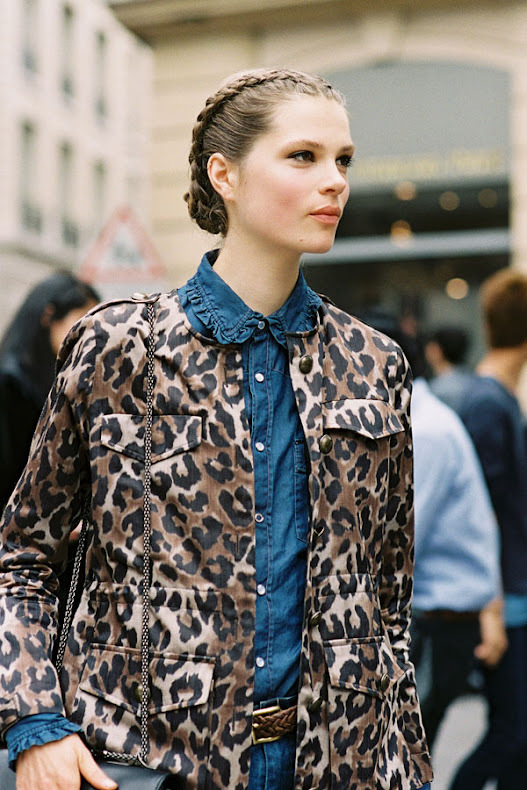 Hanneli, before Valentino, Paris, March 2012. I love all the coloured leather around this season and oxblood/bordeaux/merlot red is my favourite (followed closely by bottle/olive green). This is such a beautiful coat/dress on Hanneli....I think it may have been Valentino? Natalia Alaverdian, Harper's Bazaar Russia (photographer, stylist & fashion editor), Tuileries, Paris, March 2012. I think Natalia looks so cute in this outfit....like a winter pixie. Boots with heel detail: Alexander Wang Sigrid knee boots, Miu Miu Swarovski crystal heel boots, Twelfth St. by Cynthia Vincent Wells riding boot or Yves Saint Laurent Rita riding boots (these have detailing on the toe cap rather than the heel). Elena Perminova, before Jason Wu, NYC, September 2012. I loved the hair and make-up at Jason Wu (unfortunately something happened to my camera and I lost a heap of photos of the models after the show) but more than anything I love that Bette was wearing those incredible heels on THAT bike after the show! 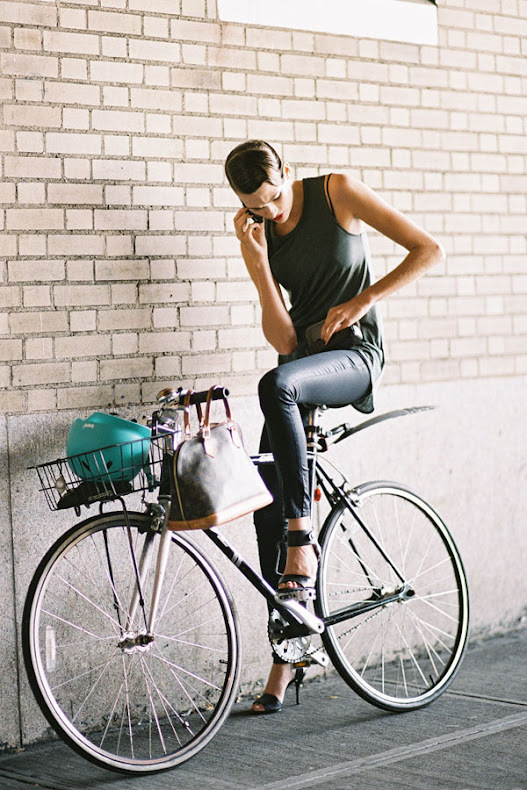 So awesome (I doubt I would even be able to get on that bike without crashing spectacularly. I guess it helps to have super long legs like hers :)).